Welcome to the last in our series on raised bed gardening. As you probably know by now, we received so many responses from my email group that this raised bed podcast turned into a three-part series. If you would like to join the conversation and contribute to future topics, I invite you to click the red “Get Free Updates” button at the top of this page. In Parts One and Two of this series, we covered everything from finding the perfect location for your raised bed garden to material choices, the perfect soil “recipe” for your beds and lots more. So if you haven’t listened to those podcasts, I recommend you start there to get you up-to-speed for all that will be covered here. Anything goes when deciding what to plant in a raised bed garden. Now that we’ve covered the basics in planning, construction, and maintenance; let’s dive into some common and specific questions asked by my email group. 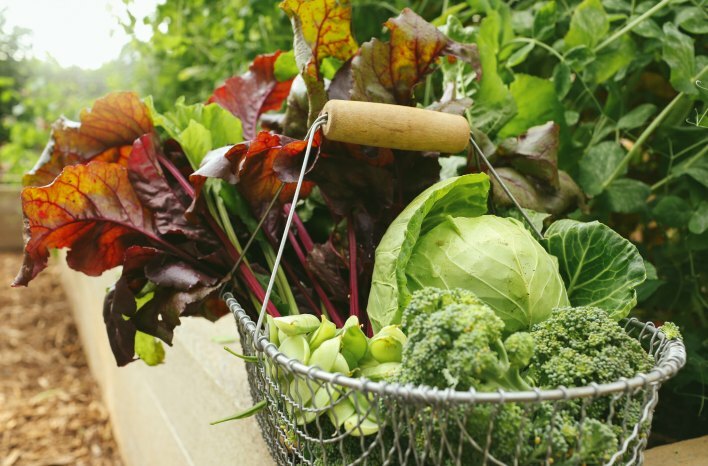 There are various methods to provide nutrients to the plants in your raised bed garden. 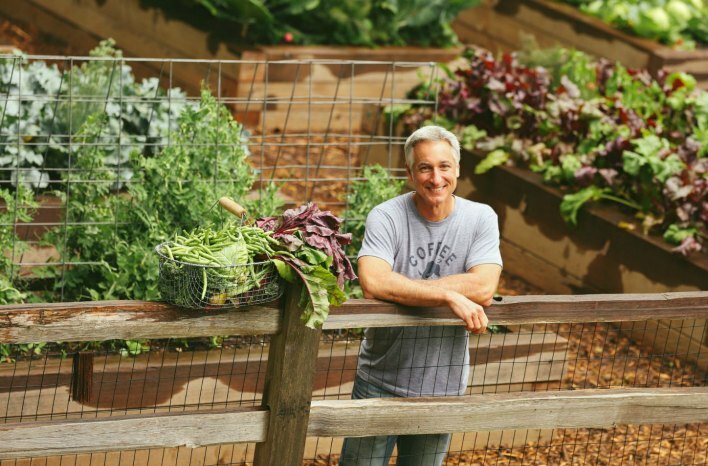 In Part Two, I covered the best organic ingredients to build healthy soil and why it’s important to focus on enriching the soil with nutrients – not with fertilizer. 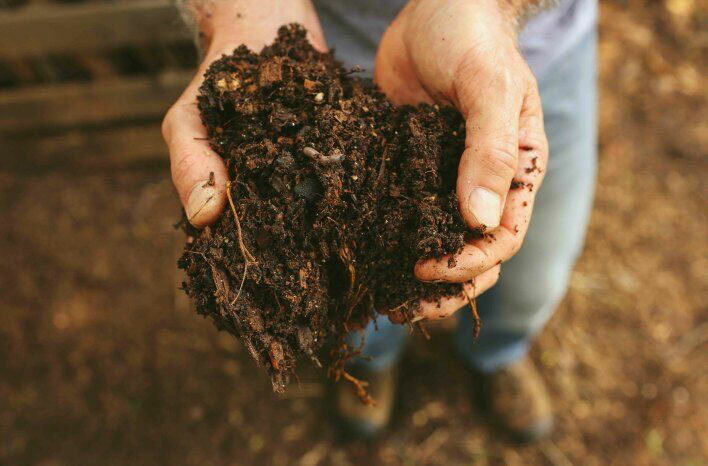 The soil ecosystem benefits most from organic ingredients, and your plants benefit most from a healthy soil ecosystem. I listed some various organic materials in Part Two, as well as tips on how to choose and what to avoid. Using any of the ingredients from that list is, in general, a much better, long-term solution than simply adding fertilizer. First Question: How do you know what your soil needs and/or which of the ingredients to use in your soil? I strongly recommend you start with a soil test – and perform a test every 2-3 seasons. Soil tests are available through your local county extension office and are fairly inexpensive. They will tell you the pH of your soil and describe (or list) any nutrient deficiencies. 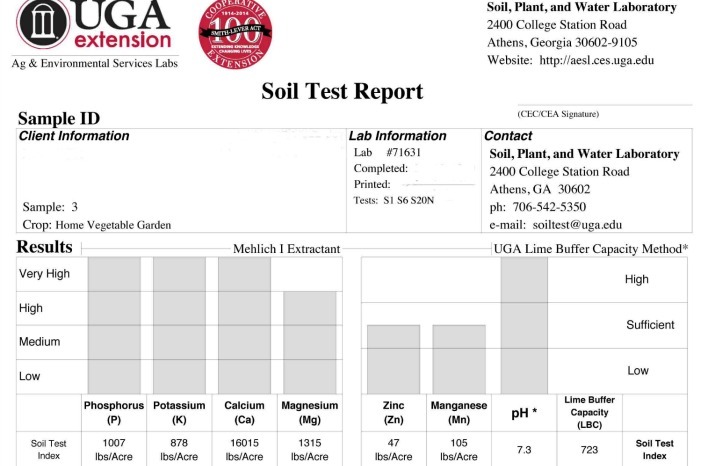 A soil test report is an inexpensive way to determine how best to amend your soil for optimal health. Second Question: What do you do with the soil test information? Begin with the pH reading. For vegetables, the optimal pH is neutral (6.5-7.0). As your soil pH reading goes above 7.0, it is tending toward alkaline. In other words, the higher your soil pH, the more alkaline your soil is. The lower your soil pH below 6.5, the more acidic it is. Some of you may be intimidated by the science-y numbers and terms behind soil testing, but it’s much less complicated than it may sound. A soil test is an invaluable partner for your gardening efforts – it will tell you what you need to add to your soil to bring it into the optimal neutral pH range. By telling you the nutrient deficiencies of your soil, the test will also help you to understand what you need to add – nitrogen, potassium, calcium, magnesium, etc. – to your soil to create the thriving ecosystem for healthy plant growth. 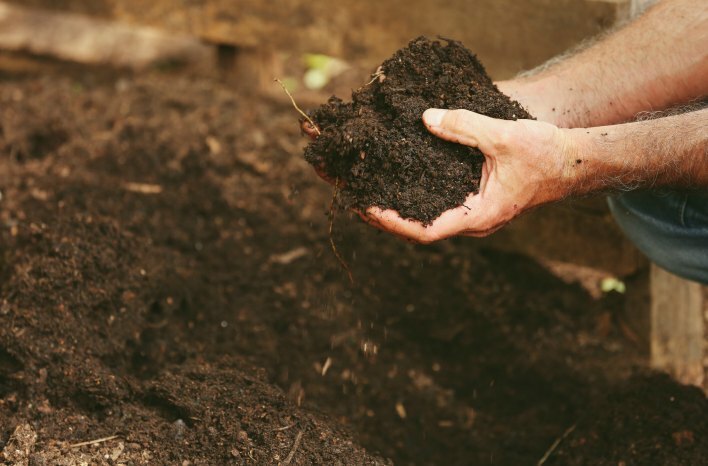 The great news is that good compost – all on its own – will have a tremendous impact on your soil pH. When you add it to your raised garden beds, using the method I describe in Part Two of this series, it will go a long way toward balancing your soil chemistry. 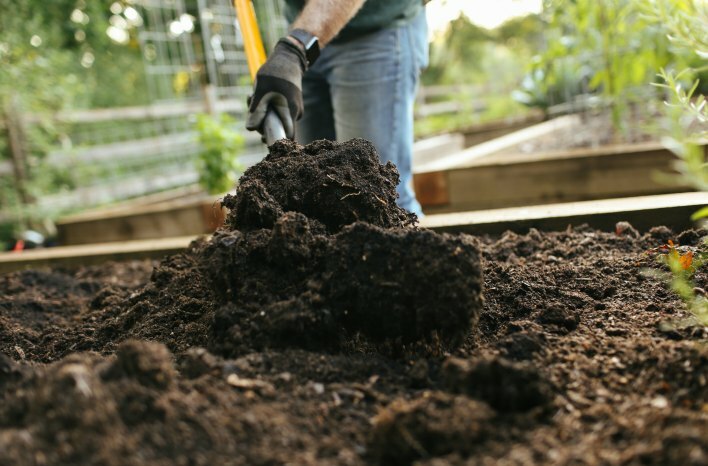 Well-amended compost has all the right nutrients to help balance pH and feed the soil. In general, all organic materials naturally alter your soil chemistry toward that neutral pH range. That means, your compost, your shredded leaves, your grass clippings, your wood chips… all of these things benefit your soil pH. Taking things a step further, the ingredient descriptions I provided in Part Two will help you identify good choices to improve what nutrients your soil test determines is missing or deficient in your garden beds. Third Question: Will the nutrients you are adding to your raised bed gardens leach out faster than nutrients added to in-ground beds? It’s a possibility, and it depends on how you are delivering those nutrients and the quality of the soil in your beds. A healthy, thriving soil ecosystem is a powerhouse for maintaining optimal moisture levels. That rich ecosystem strikes the moisture sweet spot for your plants – allowing sufficient drainage while still holding sufficient moisture. 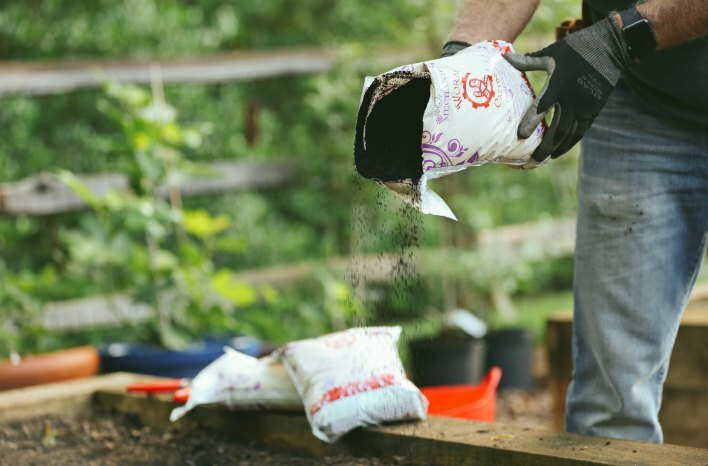 With a little patience and consistent additions of organic layers once or twice a year, you will build healthy soil that will provide your plants everything they need to thrive. If, for example, you use a water-soluble fertilizer; some of that fertilizer will leach out during natural soil drainage. How much of it leaches out will depend on the overall health of your soil to begin with. Since that healthy soil is making the most efficient use of retaining the proper amount of water, it is also doing a better job at retaining the water-soluble fertilizer. For those of you who are interested in using your irrigation system to deliver fertilizer to your raised beds, you certainly can go that route. Just know that the fertilizer being delivered that way is water-soluble – so more likely to leach out at some level. 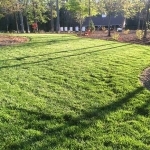 Maybe you hate to think of any of that water-soluble fertilizer being lost – even minimally. I feel the same way. I like to capitalize on what I take the time and spend the money to put into my beds – by adding those organic materials instead of water-soluble fertilizer. Feed the soil, and you will be rewarded with a healthy and bountiful harvest. Because I feed the soil in this way – building it up slowly over time and with organic materials – I rarely need supplemental fertilizer. There are a few exceptions. One of which is the once or twice each year that I top-dress my raised beds (I’ll refer you to Part Two, again, on this) before the growing seasons begin, and I usually add a little kick off with a slow-release, non-synthetic, nitrogen-based fertilizer – like Milorganite. Alternatively, you may want to review other good organic fertilizer options. During the growing season, I sometimes add a bit of organic fertilizer to heavy feeders, such as tomatoes. For those greedy guys, I’ll provide fish emulsion or other organic fertilizer two (perhaps three) times during the season. That’s about it. Everything else my plants need is already in the soilbeds because I have engineered that healthy ecosystem by starting with the right soil “recipe” foundation and amending with organic materials. This is why I love raised bed gardening. Yes, I could build the ecosystem of in-ground beds – and I do, in the landscaping of my GardenFarm. But through raised bed gardening, I have maximum control over the soil health of my beds. My crop success is a testament to my efforts, and yours can be as well. Do you have earthworms in your garden beds? You should. That’s probably not news to you, but what you may not know is how best to get those earthworms in there in the first place. Worms are just one part of the complex soil food web that serves to retain proper soil moisture balance. The old adage of “build it, and they will come” is usually true with earthworms too – especially if you create the type of soil described in this series. Worms love it! And here’s another surprisingly simple way. 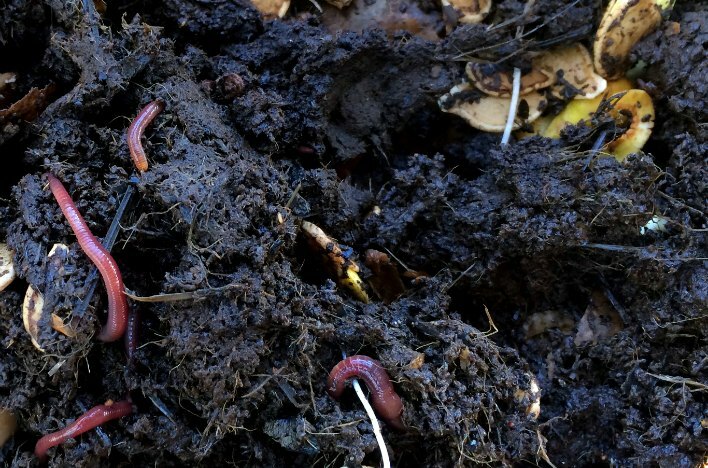 If you add fresh vermicompost (aka worm castings aka worm manure aka one of my top organic ingredients as listed in Part Two of this series), you are adding earthworms. You can add worms directly, and many gardeners do. Unfortunately, worms can die if the soil temperature dips below freezing. Those that don’t die have tunneled much deeper into soil surface (probably beneath your raised beds) for survival. Worm eggs survive freezing to hatch in spring and populate your garden beds. Many asked, specifically, about providing supplemental nitrogen. Nitrogen fosters foliage – not fruiting (actually, at the expense of fruiting). If you’ve ever had plants that looked gorgeous – green and lush – but were producing lackluster crops, take a look at the nitrogen count on any fertilizer you were adding. Odds are you were adding too much nitrogen to your soil. 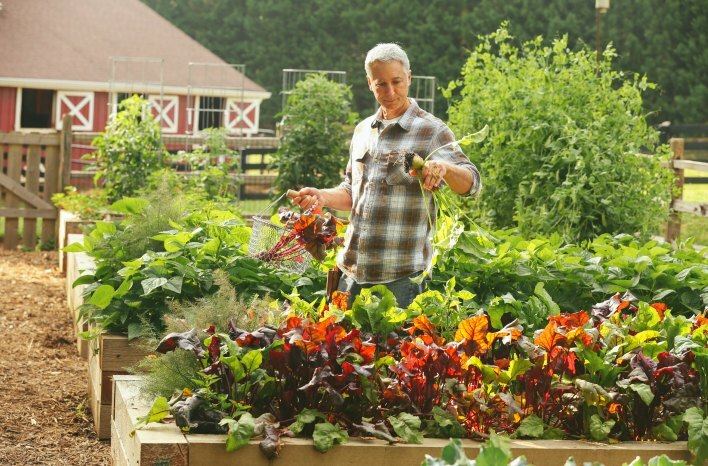 What Should you Plant in your Raised Bed Garden? When choosing what to plant, consider your space. You can grow nearly anything in your garden beds. It’s the raised bed “real estate” available in your garden that is, by and large, your only limiting factor. 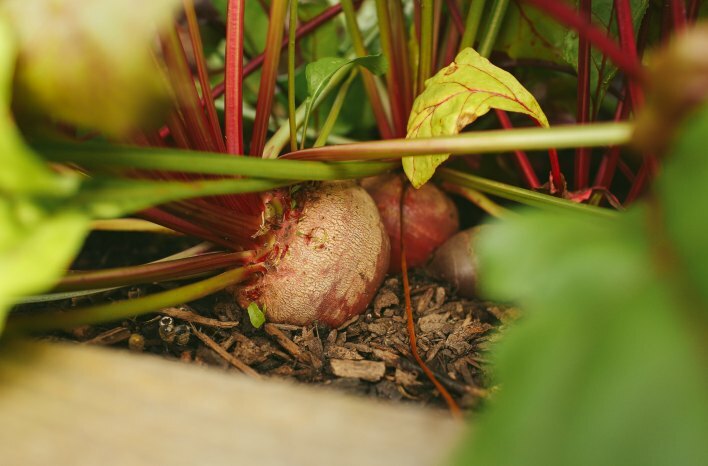 Beets and other root crops enjoy plenty of growing room in the GardenFarm raised beds. If your beds are around the minimum depth of 6” or so, you can still grow root crops, but you will be stretching the limits a bit. As mentioned in Part One of this series – if you want to grow potatoes, carrots, parsnips, etc. ; consider starting with deeper beds (up to 18”). Perhaps you have a huge raised bed garden area? You might well be happy to designate some of that space to a more permanent crop – like asparagus. Asparagus crops improve when they re-sprout year after year in the same location. Berry bushes could also be grown in a raised bed situation – again, should you choose to allocate space for them to remain indefinitely. If you want to keep your gardening options open, you may want to stick with those one-year crops; like tomatoes, eggplant, corn, potatoes, cantaloupe, watermelon, etc. Yep – I did include cantaloupe and watermelon in that list. I’ve grown them in the GardenFarm raised beds, allowing their vines to trail down into my walking paths. I was happy to give them that space in return for their sweet produce. Some plants, I prefer to grow in-ground simply because I don’t want to surrender raised bed space. An example of that is my blueberries. 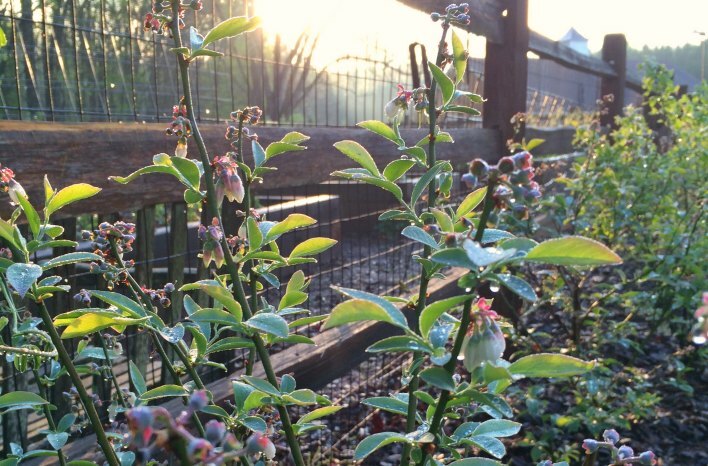 My blueberry bushes grow happily – and indefinitely – in the ground just outside my raised bed gardens. Blueberry bushes enjoy a permanent in-ground home just outside the GardenFarm raised bed area. It’s largely all about how you choose to use your space. Don’t hesitate to mix your crops or grow them in neat rows or squares. Simply make the best use of the space you have to work with. Speaking of Space – Care to Know How to Space those Plants? How close should those rows or squares be? How tightly can you mix those crops? There is no hard-and-fast answer to those questions. When I’m planting my raised beds, I do so with an understanding of how large I expect each type of plant to get, and I space them so – at fully-mature size – they will be barely touching each other. I do that to allow good air flow and light to reach each plant and all the areas of the plant. Restricting airflow and light is a great way to encourage pests and disease into your garden beds. Plants can also shade each other out when they are too close, and you don’t want that to happen. As an example, I plant four tomatoes in one of my 12’x4’ raised beds at the GardenFarm. In those instances where the plant is indeterminate, size can be controlled by the cage or other support structure you have in place for the plant. I like to give my tomatoes plenty of room to spread out and produce copious crops. Tomato plants thriving in the GardenFarm raised beds. If in your gardening experience you have done battle with pests or disease, try opening up the spacing a bit this season. The impact of spacing on pests and disease does depend somewhat on the type of plants you are growing, your environment, and – again – the health of your soil. So, don’t be afraid to experiment with spacing – just remember that providing that air flow and light really is important. For those of you who are interested in mixing your crops, let’s dive into companion planting. This was another popular topic for questions. There is some physical, chemical and biologic evidence; but there really isn’t much in the way of valuable, measurable scientific evidence on companion planting. In fact, companion planting was covered in one of my Myth-Busting series with Linda Chalker-Scott. Pineapple sage blooms in the GardenFarm raised cabbage bed. A common companion planting example is The Three Sisters. The corn, beans, and squash of The Three Sisters combination don’t rob each other of nutrients in the soil, and they do benefit each other. The beans are a nitrogen fixer – adding nitrogen to the soil for the corn and squash (or any other plants surrounding the beans you plant). The corn provides physical support for the beans to climb. The large leaves of the squash effectively mulch the surface where The Three Sisters are growing, shading out the sun and protecting the soil and plant roots. In other words, The Three Sisters provide some basic, fundamental benefits to each other – but they aren’t unique to that specific grouping. Corn, for example, could also provide structure to snap peas or any other climbing edible. If you do mix your crops, don’t feel the need to customize your soil amendment to pamper certain crops. Most everything you grow will thrive with the same, neutral pH level and access to the same nutrients. There are a very few exceptions, like blueberries which want that acidity. For those exceptions, plant in a separate bed or in-ground. Flowers can often be overlooked in raised bed plantings, but they certainly shouldn’t be. Obviously, they add color and aesthetic value – but they also draw in the pollinators that will increase your crops. In general, I stick with annual flowers. Perennials can be difficult – but not impossible – to work around when planting crops or amending the soil. Niki Jabbour has been a podcast guest of mine and is a big fan of using flowers, especially edible flowers, in the vegetable garden. Don’t adjust your soil maintenance for flowers. The same amendments you add for your vegetables will prosper your flowers too. 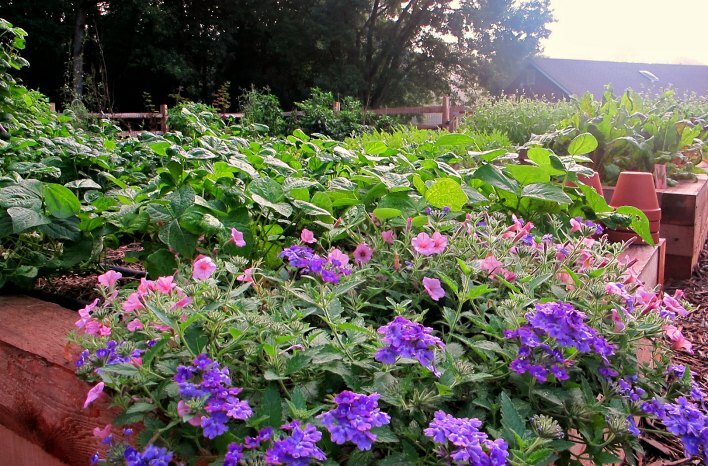 Flowers are a common and beneficial staple in the GardenFarm raised beds. Is it necessary? Not really – for the home gardener. Crop rotation is a big deal for large, commercial agricultural producers. That agricultural model is focused on monoculture — growing one crop in a large space. What is crop rotation? Envision a garden with four beds. The first year, bed one contains eggplant. The second year, eggplant is grown in bed two instead. In the third year, eggplant is grown in bed three. You get the picture. During the fifth season, the eggplant is grown, again, in bed one. When following crop rotation, it’s recommended that at least four years pass between crop placement. In this case, our little garden scenario might need to build a fifth bed! Why does crop rotation matter? One key reason is pests and especially soil-borne disease. Certain plants are attractants for certain pests and/or disease strains. Tomatoes are particularly susceptible to Early Blight. So, lots of tomatoes grown year after year in the same place will foster the likelihood of an Early Blight issue. It’s the equivalent to holding a gastronomy convention for aphids. If the convention is small, fewer aphids will be interested in attending. If the convention is Super Bowl-size, you can bet those aphids will spread the good news. So for large, mono-culture farms – crop rotation can be a big deal. They have to keep moving the convention to confuse those pests and diseases. When the same crop remains in the same place year after year, soil-borne diseases are provided an environment in which to really run rampant. Moving crops prevents the development of a sustainable disease environment. Great soil should be a dark, rich brown. It should bind together and break apart easily. 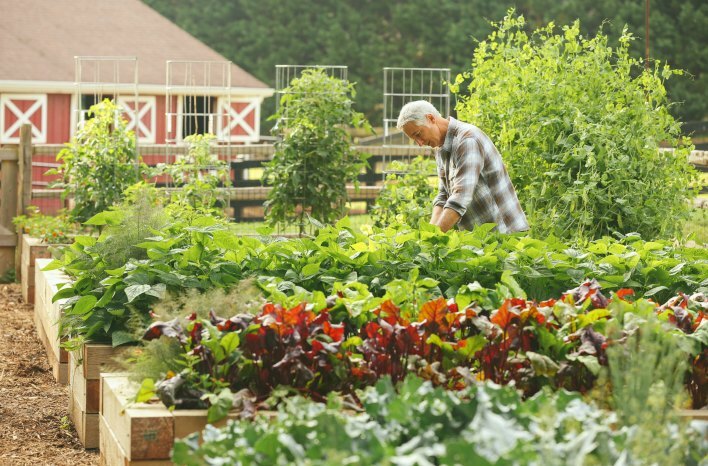 For the backyard gardener, it’s simply less of a necessity. I have done some rotating of crops in my garden, but I haven’t seen much difference in pest or disease problems. If you have the room, aren’t shading out smaller plants, and feel more comfortable rotating your crops – go for it! If you don’t have space or interest in moving your crops year to year, it’s likely not going to cause you much grief. In general, it’s just not a practical use of home garden space. There is a caveat under which I recommend you do give crop rotation more consideration. 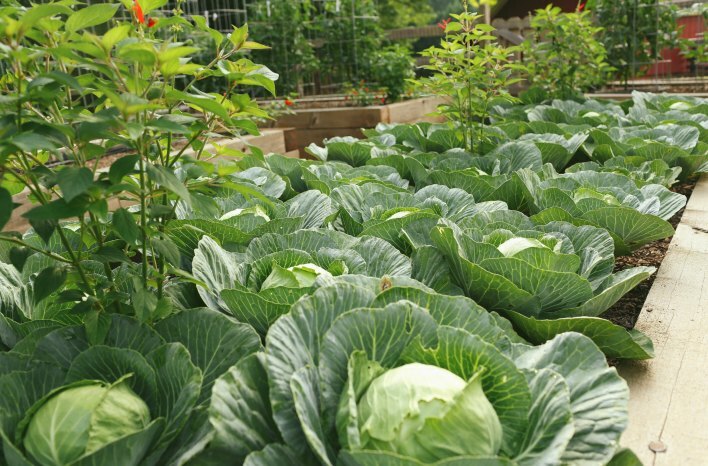 If you are planting a heavy-feeder crop – like tomatoes, brussels sprouts, corn, etc. – it may behoove you to relocate those crops in different seasons. Alternatively, you could amend the soil specifically to address the nutrients that crop has gobbled up. If you do that, crop rotation is probably still not necessary. But if you don’t amend to offset such a heavy withdrawal of a certain nutrient(s) being taken up by that crop, move them to another area of your raised bed garden. There are so many variables dictating succession planting. Maximizing the number of crops you can grow each season through succession planting – planting early-season crops followed by warm-weather crops – is dependent on region, the plants you want to grow, your garden set-up, etc. It’s just too much to cover appropriately during this podcast, so I’ve covered that in a separate podcast. Here, too, is an article that you might find helpful. 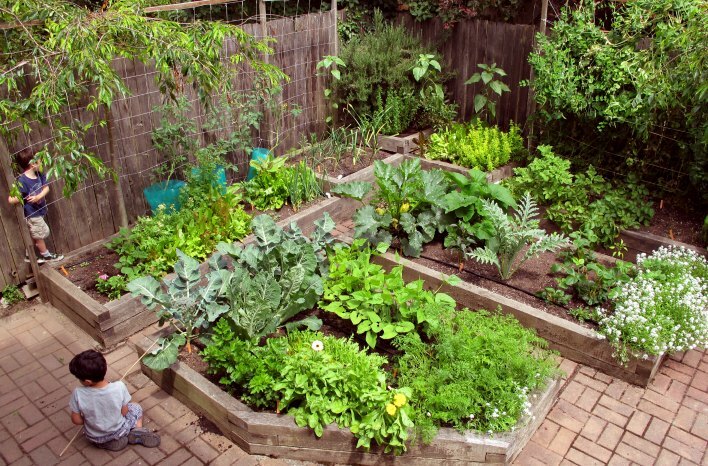 An urban backyard raised bed garden makes an enjoyable and efficient use of space. Some gardeners rely on – and some resources recommend – planting cover crops. The intended benefits of a cover crop are twofold: Protect (mulch) the soil surface, and add nutrients and organic matter to the soil subsurface. The benefits of cover cropping are undisputed, and a standard practice in organic agriculture. In fact, it’s an essential practice to achieving ultimate soil health in those applications where it’s practical. 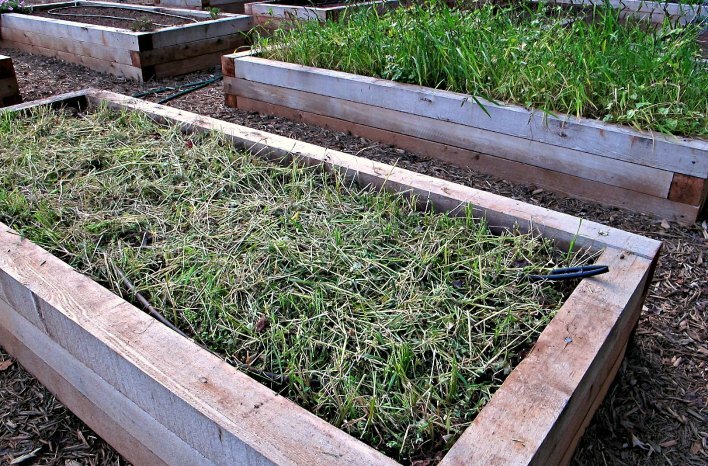 Planting a cover crop can benefit soil structure and health in a raised garden bed. Yet if you’ve been following along, you probably already know that I prefer to use a layer of organic mulch over my raised garden beds. I also prefer to add organic material and nutrients by using one or a combination of those organic ingredients I keep mentioning from Part Two of this series. My rationale has a lot to do with practicality in managing raised bed garden soil. Why? As I explain in Part Two (there is so much information there! ), I follow a no-till method of gardening. A short soliloquy on why I don’t till: It breaks up much of what I am striving for when building my healthy soil ecosystem. Cover crops are typically cut down, and often, the crop and the soil bed are tilled together. For me, the drawbacks of this approach outweigh the benefits in a raised bed home garden. What is a cover crop? Green manure aka cover crops can be any one of some materials – like rye, field peas, buckwheat, clover, etc. – planted between growing seasons. Many cover crops develop strong, deep root systems. Ideally, the roots of the cover crop are allowed to break down (rot) over time, adding organic matter to the bed. Until they break down, they are taking up valuable root space in the garden bed. Some popular cover crops are heavy grasses, and their root systems can be tough to get out when preparing for your edible crops. The foreground cover crop has been cut down and is ready to incorporate into the bed. I find that using cover crops is more work than the benefit I attain in a home garden raised bed, and I achieve the same benefits of cover cropping (with less effort) by top dressing with compost or other organic amendment and always using an inch or two of mulch. Whichever route you choose – never leave your soilbed exposed. Reduce weeds – Seeds blowing in can’t take root, and seeds in the soil can’t germinate without the sunlight hitting the soil surface. Moderate the soil temperature – In extreme heat or cold, mulch will act as a barrier to your soil temperature and those plant roots. Reduces evaporation – Wind and heat from the sun don’t have a chance to dry out your soil when mulch is in place. Blocks disease – Even in healthy soil, there are diseases lurking down there. During a heavy rain or splashing irrigation, those diseases can splash up from the dirt onto the foliage of your plants unless…. Ah yes, you have mulch preventing any water from splattering up in the first place. Oh, how I love my mulch. 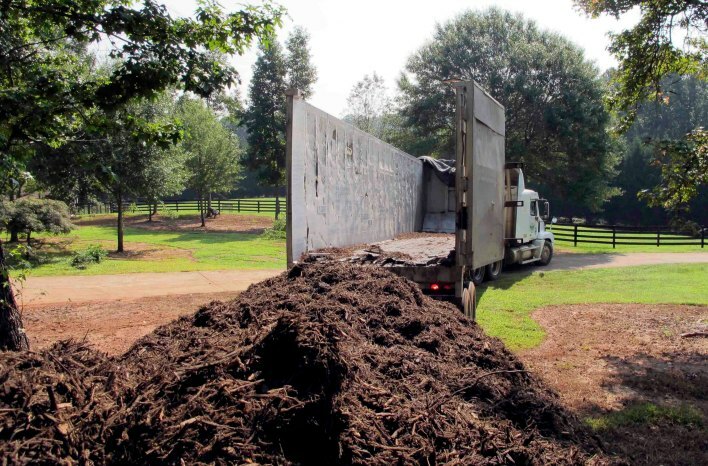 At my farm, I use so much mulch it’s delivered by a tractor-trailer. A 2-inch layer spread over all my beds will do so much to easily justify the investment. Some of my email group noted the common use of black plastic row cover instead of mulch. This is a popular option for in-ground rows, and an application example is strawberry growth in large commercial operations. Black plastic can reduce evaporation, but it can also really bake the covered soil. For that reason alone, I’m not a proponent of black plastic. Plus, well, it’s plastic. Again, I also prefer that mulch breaks down over time, further feeding my soil. In my experience, black plastic just can’t compete with a good layer of mulch. Do I use mulch on my pathways? Sure do. I use 2” of mulch on the spaces between my GardenFarm raised beds. It does a remarkable job keeping weeds at bay, and it looks nice too. I, typically, have to spend time weeding just once each season, and I prefer to use a scuffle hoe for that job. The scuffle hoe cuts the weeds at the surface – making quick, effective work of it. You might also choose to use a layer(s) of cardboard or other organic material to mulch between your raised beds – any of which are great options. If you have hardscaping between your beds, a scuffle hoe won’t fit the bill for you, so you may want to use a flame weeder or resort to hand pulling. An organic herbicide is another weed management option, but I’m always leary of the unintended harmful effects that organic herbicide – like vinegar – can have on amphibians and other beneficials that I strive to keep around in my garden. 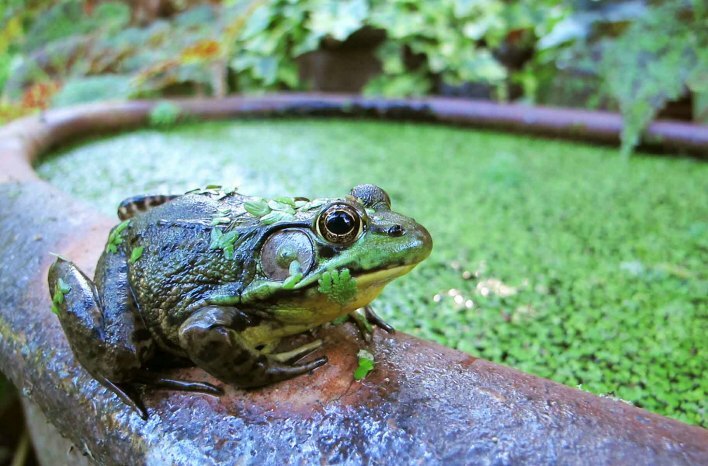 One of many happy frogs that live in and around the many water gardens that Margaret Roach provides in her landscape. Can oak leaves be used as mulch? Indeed. Yes, oak leaves are highly acidic (around 4.7). When used as mulch, they remain on the soil surface, so there will be a buffer from much impact to your soil pH. As they break down and join your soil, their pH level will neutralize. Oak leaves are slower to break down than many other leaves. Some will see this as a drawback, others as a benefit. As for me, I prefer materials that break down fairly quickly. One way to encourage their breakdown – should that be your preference – is to shred them. The smaller shreds break down much more quickly than whole leaves, and – bonus – they are also easier to apply to the soilbed. You might also consider adding oak leaves to your compost pile. If so, I definitely recommend shredding them first. If you have lots of oak leaves, it would be worthwhile to designate a compost bin just for oak leaves. Keep them moist, mix them up periodically, and allow them to break down to a more benign material. How do I shred leaves? There are many ways to doing this. Use a chipper shredder, or you can mow over the leaves and pick them up with the bagger. A more creative approach is to place the leaves in a large plastic bin (picture a garbage can) and lower your string trimmer down into the bin. That string will shred the leaves pretty effectively (like an immersion blender), and I must admit, it’s a little fun to watch. 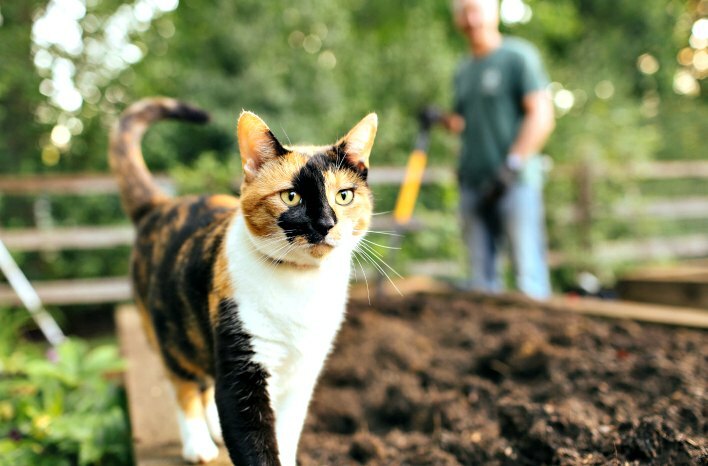 As someone who shares my property with a few barn cats, I know what a pest felines can be in garden beds. My favorite deterrent is livestock panels. Cats are common visitors (and problems) in the garden. Livestock panels are inexpensive, and I can easily cut them to the shape of my raised bed surfaces (or suspend them an inch or two above the surface). Once I’ve placed them on the beds, I can use them to space my plants too. The plants grow through the panel, but the cats can’t scratch around it to the surface. Livestock panels work just as well for digging dogs and other large digging creatures. I even find that squirrel problems are far fewer when livestock panels are in place over the soil. These burrowing pests are best prevented during the raised bed construction phase. For that reason, this deterrent was covered in Part Two of this series. In short – hardware cloth, properly installed before adding your raised bed soil, is your best bet. Any of the smaller pests which will attack your raised bed garden from above… well, if you have found a good solution, I want to hear from you! These pesky critters are just too nimble and versatile for a one-size-fits-all solution. They can climb, tunnel, jump – if they were faster than speeding bullets, we would all really be in trouble. So truly, please share your solution in the Comments section below to divulge your best solution for above-ground rodent control. Please. 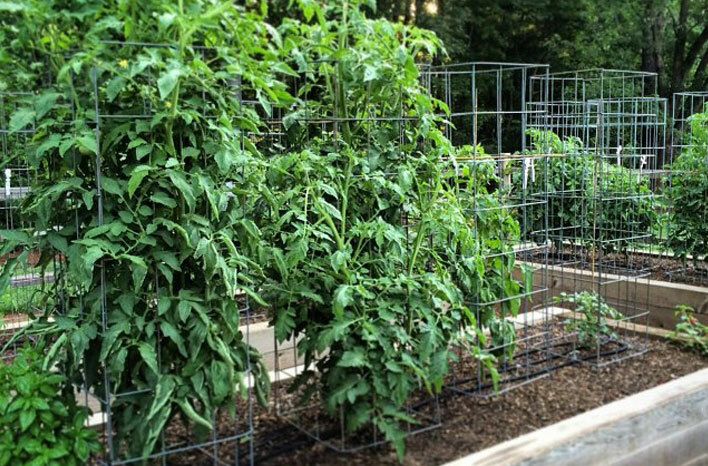 Taking no chances – a tall fence blocks out garden pests. These little buggers can be a mighty foe in the garden. Now, your everyday, garden-variety black ants aren’t a concern, and they are actually a valuable part of the soil food web. Let black ants be – and while you’re at it, the same applies for pill bugs (aka roly-polies). These are your friends in the garden – unlike the fire ant. If you’ve ever been bitten by a fire ant, you understand the searing pain and subsequent days of misery. Like bees, each colony has a queen – although some colonies have multiple queens. The only way to truly eliminate a colony is by eliminating the queen (or queens). The ants build large mounds, from which the worker bees spread out to forage on surrounding plants and animals. So, will they invade your garden? They certainly may. Fire ants like spots in full sun and with moist, soft earth – in other words, your ideal garden environment. Fire ants are such a large problem and “hot” topic that I will be covering them much more in-depth in a future podcast. No doubt, you have searched the internet for methods to eradicate or control fire ants. If so, you have drowned in page after page of chemical and natural suggestions. I will cover what works and what doesn’t in that future podcast. Pour boiling water over/into the mound. Again, that boiling water must reach the queen(s) to be effective, so it may take several boiling applications to finally kill the colony. Natural orange oil has also been proven as effective against a fire ant colony. The Texas Imported Fire Ant Research and Management Project at the Texas A&M AgriLife Extension has confirmed through their research that 1.5 fl oz of orange oil and 3 fl oz of dish soap (they used Medina® Orange Oil and Dawn® soap specifically in their study), diluted in one gallon of water was more effective than a leading organic insecticide product – when one gallon of the orange oil solution was dumped on each mound. There are a number of organic and chemical pesticides in various forms which can be effective in the long and short term to eliminate fire ant mounds in the landscape. I don’t recommend using any pesticide in raised bed soil – organic or inorganic. Boiled water and orange oil are safer, in general, but may well kill or seriously damage any nearby plants. In my many years of gardening in the southeastern U.S., I have never had an issue with fire ants in my garden or in my compost bins (another fire ant favorite spot). Why? I’m not exactly certain. Some studies show that fire ants do not like soil with lots of microbial activity. Guess what – my garden soil has microbial activity going gangbusters. Coincidence? I honestly don’t know, but it may be worth a try for you. Worm castings are an amendment staple at the GardenFarm. I’ve written a guide explaining how I maintain my compost beds too. I honestly can’t guarantee that building healthy soil and compost bins will prevent fire ants in your garden, but it does seem to be working for me. I will keep you updated if anything changes. Many people don’t realize that, during mating season (typically spring), fire ants fly through the air and drop to the ground after mating. 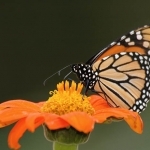 Queens will become airborne (some reaching significant heights), mate, fly to an appropriate colony spot, shed their wings, drop to the ground, and produce new colonies. Our battle against fire ants will be ongoing. Building your beds at 18” or even a bit higher, if possible. It will be a little more work and expense at the outset, but higher beds will be easier to access with less bending over once they are in place. Building a platform garden. I realize that building raised beds 20” or higher isn’t very practical, and it can be expensive. A better option may be a platform garden. This elevated format allows room to wheel underneath and faces the bed directly. Of course, it is critical that the platform be strong. Here are instructions for a design that I recommend. Consider adding a handrail to the side walls of your beds. Hardscape the space between your beds with a non-slip material. Alternatively, build the beds on existing concrete or other hardscape surface, like a driveway or patio. Just be sure to leave the bottom of your raised beds open to the surface to allow the water to drain away easily. Leave at least 3’ between your beds to easily accommodate navigating through the garden. Use a two-wheeled wheelbarrow. The two wheels provide better stability than the traditional single-wheeled version. A garden cart can be another, more stable option. Both the cart and wheelbarrow are commonly available at most home improvement and nursery centers. 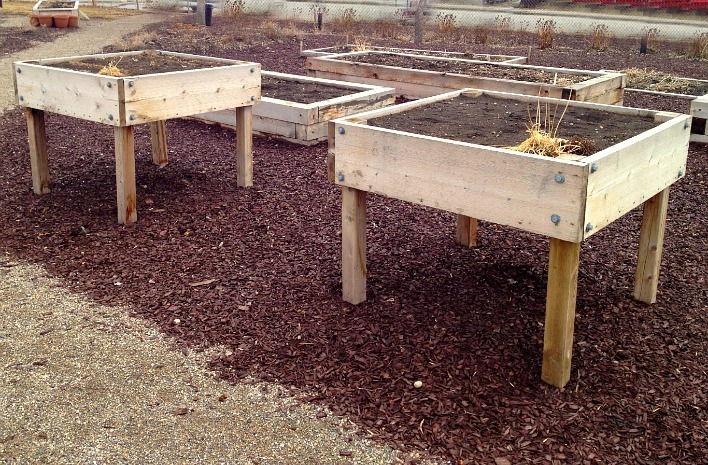 Building a platform garden bed can be a more practical approach to adaptive gardening. In short, find the height that is most comfortable for you and be practical in your approach. 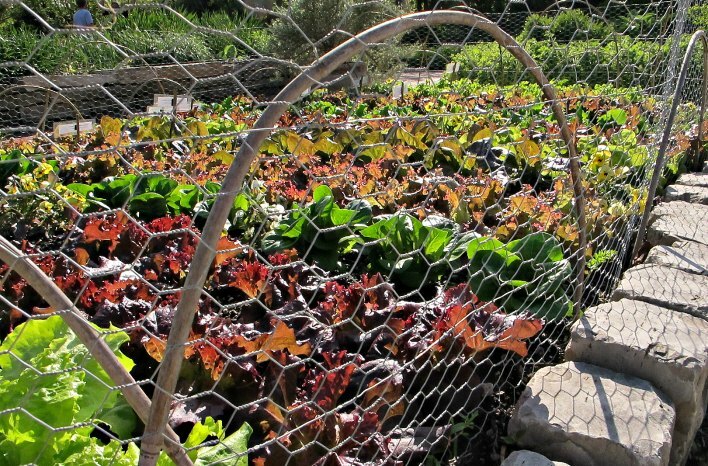 There is much more on adaptive gardening than could be included here, but there are additional resource links with more details (and even tool tips) in the Links & Resources section below. This method is said to mimic the natural process that occurs in the forest – layers of organic material building on top of each other and breaking down to form rich, moist soil. Building a hugelkultur bed starts with a bottom layer of various-sized tree branches, logs, and stumps. That woody base is covered with layers of other materials: grass clippings, soil, newspapers, cardboard, compost, leaves, etc. The final layer is typically a mulch of some sort: wood chips, straw, etc. Once built, all the layers are thoroughly wet down to begin and foster the decomposition process. Once decomposition is taking place, the bed generates heat – allowing it to be ready for planting earlier in the year. Plants are grown on the sides and top of the bed. 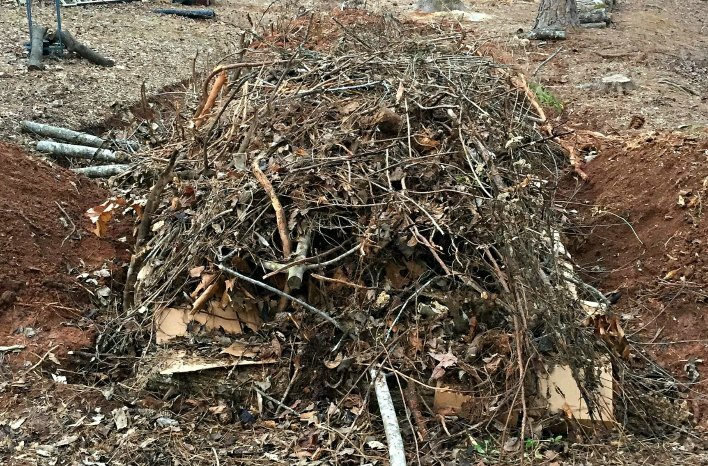 If you have a lot of yard waste from various clearing projects, hugelkultur could be a solution to keep those larger pieces out of the landfill. There are, however, some drawbacks to keep in mind before you start to build your mound. While the woody material is in the early stages of decomposition, it is actually eating up more nitrogen than it is giving off. So, it’s often recommended that you only plant low nitrogen plants for the first season or two. It was noted in one study that wasps had found their way to the cavities between the wood in the first layer and had taken to nesting there. Other hugelkultur gardeners have found pest management to be an issue, as well. For these and other reasons I will cover further in my future podcast, I prefer the traditional raised bed method. By building good soil, utilizing efficient watering techniques (drip kits, soaker hoses or emitter tubing) and always topping things off with a layer of mulch; I am creating that healthy ecosystem for my plants without the drawbacks that can come from the hugelkultur method. Perhaps, you have had great success with hugelkultur. If so, I welcome your comments at the bottom of the page. As I’ve said before, we can all learn from each other’s success or failure. This method is, in essence, a raised bed (often the shape of a pie with a piece removed) built around a compost bin. The outer areas of the garden surface are planted, and the area where the pie piece has been removed (for lack of a better visual) is where you access the plants and the compost bin. The theory of a keyhole garden is this: As you throw your kitchen scraps and other compostable material into the bin area of the keyhole garden, the materials break down in the bin, and the resulting nutrients are taken in by the soil surrounding the bin. 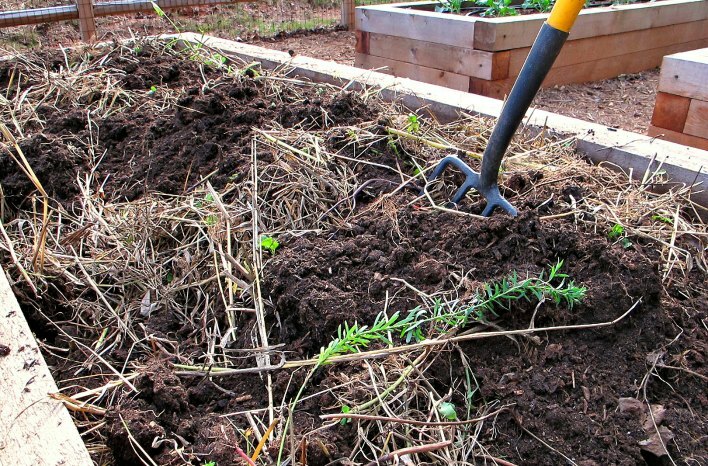 It’s recommended, following the principle of hugelkultur, that the bottom of the compost bin be filled with twigs and other large debris – even non-organic garbage materials (which I don’t recommend). Layers are then added, similarly to the layered structure of a hugelkultur bed. We featured a keyhole garden on an episode of GGW. Perhaps, you have had success with and joy from a keyhole garden setup. That’s great, and I welcome your comments below! The primary motivator for sunken bed gardening is to capture as much and make the best use of any water available in those dry areas. Water – whether in a rain event or through irrigation – is held by the large area in which the plants are sitting (as in option 1), or it’s held in the trenches that surround the mounded plants (as in options 2 & 3). Sunken beds aren’t for everyone In my future podcast on alternative methods; I will dive more deeply into when they may not be a good option. 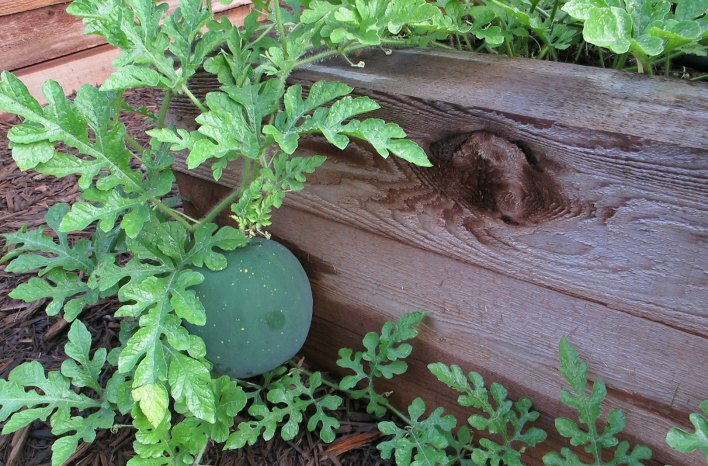 Melons are allowed to explore their surroundings and spread into the pathways of a raised bed garden. Watering a sunken bed is typically done by flooding the depression or the trenched areas. These sunken areas hold the water from running off and away from the garden plants. Although I haven’t personally gardened in a sunken bed, I have concerns with the trench-flooding water method around which the sunken garden is designed. Some of that exposed water will inevitably evaporate in the heat. The water soaks into all the surrounding area and can’t be accurately targeted to plant roots, which is where they need it most. As an alternative method, I recommend the more efficient watering systems offered by emitter or soaker irrigation. A core garden is very similar to a traditional raised bed setup, but a trench is dug down the length of the bed in the middle. Straw or some other carbon-based material is placed into the trench and thoroughly wet down. The principle here is that the material in the trench will help to retain moisture and will release nutrients to the soilbed as the material decomposes. This may be an option you are interested in trying. If so, I welcome your Comments below. Share your experiences. Root crops, like beets, do well in deep raised garden beds. You may be considering a wicking raised bed. A wicking raised bed is built to allow moisture to be consistently wicked up from the bottom of the bed. I’m not a big proponent of this method. Firstly, the wicking maintains constantly moist soil. Note I said constantly – not consistently – moist. You might think this would be a good thing, but it can hinder the growth of many plants. It prevents your ability to control moisture in relation to how your plants are responding. Wicking also keeps more moisture toward the bottom of the bed and gets drier as it reaches the surface. For young plants, this is a particular problem. They need the moisture near to the surface as their roots develop there. Wicking beds are expensive to build, and I simply find them to be an inefficient and sometimes detrimental watering method. There you have it! Answers for all the questions I’ve been asked on the topic of raised bed gardening. If you haven’t already, I recommend you listen to this podcast too. The recording is linked at the top of the page and includes a few stories as well as thoughts on planting over tree roots. I also invite you to sign up for the Raised Bed Gardening Resource Guide, built around all the information covered during this series and plenty more that couldn’t be covered as part of the podcasts. You can sign up at the top of this page by clicking the red “Get Free Updates” and entering your first name and email address. Finally, a word more of advice to those of you new to gardening. Go slow. It is so exciting that you are joining the gardening world. But it is so easy to overdo it. Gardening should be fun and enjoyable, not another to do list, so don’t get overwhelmed. Remember that there are future growing seasons to enjoy, so “grow” into gardening and add more next season. And the next, and the next. That will give you more time to learn here, too, with more podcasts and more blog posts. Welcome to the journey. P.S. – Did I mention not to waste your money on tomato cones to stake your tomato plants? You know, those cheap wire cones you see everywhere for tomatoes? They don’t work. Use livestock panels instead – they’re the best bet for my money and yours.